For all the strong, amazing children with eczema, this one’s for you! Did you know October is Eczema Awareness Month? To celebrate, we are releasing The Eczema Song worldwide today, October 1, on YouTube. 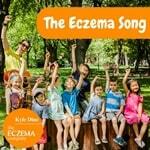 Get ready to sing-a-long with your children to this empowering and fun song, written and performed by Kyle Dine, that will help you with the daily struggles of living with Eczema. Please LIKE and SHARE the video to help us spread ECZEMA AWARENESS worldwide! Jennifer Roberge, founder of Its An Itchy Little World blog and The Eczema Company, co-created The Eczema Song with singer/songwriter, Kyle Dine, in an effort to bring some fun relief to the daily stress of eczema. The video is available on YouTube. Eczema Awareness Month (October in the USA & November in Canada) is shedding a spotlight on the more than 10-20% of kids in North America who suffer from eczema. It’s a heavy burden for little ones to bear; the stares from other kids or parents, the relentless itch and the struggle with mittens, wraps, and creams. The Eczema Song is dedicated to all the strong, amazing children who have eczema but won’t be defined by it.